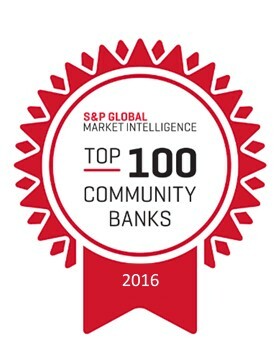 For the second year in a row, S&P Global Market Intelligence ranked Plaza Bancrop (“PLZZ”) as one of the top 100 community banks in the nation. PLZZ, a portfolio company of the Carpenter Community BancFunds (“CCBF”), was ranked 29th of 546 peer banks across the country with assets between $1 billion and $10 billion. This ranking placed Plaza in the top 5.4% of all such banks nationwide. S&P’s determination relies on a rigorous, quantitatively driven analysis of all banks in the asset range throughout the country. The analysis was “calculated based on six metrics: pretax return on average tangible common equity, net charge-offs as a percentage of average loans, efficiency ratio, adjusted Texas ratio, net interest margin on a fully taxable equivalent basis and loan growth,” according to S&P Global. Each of the six metrics were given an equal weight in determining each bank’s overall rank. S&P Global Market Intelligence is the premier data provider on financial institutions and community banks, and a respected voice in the industry. We are proud to have one of our portfolio companies, Plaza Bancorp, receive this recurring recognition for its fine performance.